It doesn’t matter how brilliant it looks on the chalkboard, if you can’t block it, you’re screwed. As coaches we love to draw up all kinds of fun stuff, but when it comes time to execute, if you can’t get any movement up front at the line of scrimmage, you’ve got bigger problems that drawing up more plays won’t solve. And that’s why you’re here, to solve a problem. Bob Wylie has been coaching offensive line at the highest levels of the game for years, and today we’re gonna go over how to coach offensive line stance. Relax, you’re not going back to geometry class, but there’s an important lesson here. Whether it’s missed assignments, poor leverage, or all kinds of other issues offensive line coaches run into on a day-to-day basis, it can usually be traced back to their angle of departure off the line. Usually the reason an offensive lineman departs from the wrong angle is because their stance is wrong. When your stance is wrong, it means your weight isn’t distributed properly which leads to wasted steps, false movement, and makes you slower as an offensive lineman. Since we love you so much here at CoachTube, we decided to give you a checklist to go over when you’re teaching your players about the importance of stance. The stagger should be toe-to-head or toe-to-instep, with your inside foot up and your outside foot back. Inside foot should be flat on the ground, outside foot should have about a half inch of air underneath the heel, no more than that. The outside foot should have toes slightly turned out just a little bit. Bend your knees, and put your elbows on top of your knees. When you bend down, your knees are gonna be inside your feet, not over your feet, make sure your knees are pointed inward just a little bit. Take your off-arm, the hand that’s not on the ground, take the inside of the elbow and put it on the outside of the knee, keep your hand semi-relaxed. Put your down hand on the ground and put it somewhere is the area of your outside eye. Make sure all five fingertips are on the ground in front of you. To be sure you’ve got it right, pick up your down hand and stretch it out in front of your. If you have to shift your body weight to stretch it out, your stance is wrong and you’ve got too much weight on your down hand. When your weight is distributed wrong, it leads to false steps and wasted movement, which again, leads to playing slow. The thing about it is, relaxed muscles move faster than tense muscles, so when the ball is snapped and you try to make a move, the first thing your body does relax itself if you’re all tensed up. Why not skip that step and just start out relaxed so you’re ready to go as soon as possible? We talked in the beginning about weight distribution, but we’re gonna talk about it again because it’s a huge part of this. As an offensive lineman, you want to mentally transfer weight away from your opposite foot. Let me explain what I mean. For example, if you have to step with your right foot, you’re gonna mentally shift your weight to your left foot so you can take your first step at the snap. You don’t wanna make it harder to move your feet, and if you’re shifting weight to the first foot you’ll be moving at the snap, you’re making it so you’ve gotta move a concrete block instead of an empty cardboard box. Don’t make it harder on yourself, move your weight to the correct foot! If you liked what you read, check out the link below to see the whole video with even more detail. 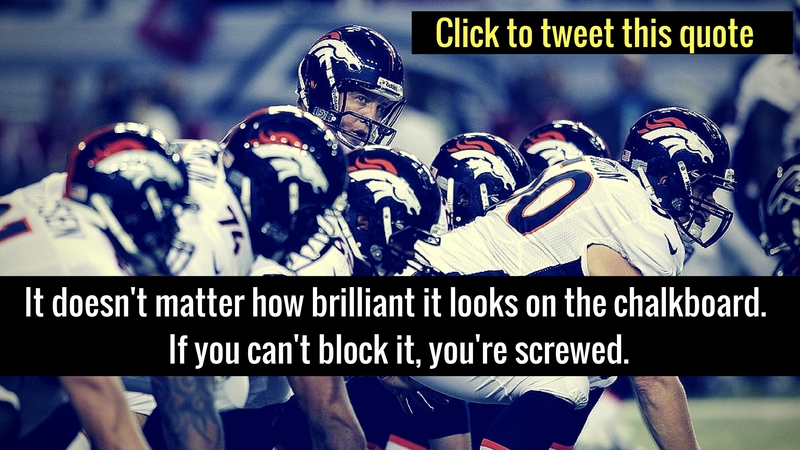 Click the link to watch more great videos on how to coach offensive line.